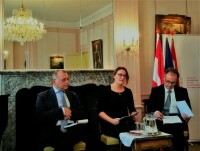 On 1 October 2018, Xandra Kramer moderated a meeting on the Role of the European Union in Private International Law, organised by the Austrian EU Council Presidency at the Austrian Embassy in The Hague. The speakers were Christophe Bernasconi, Secretary General of the Hague Conference on Private International Law, and Robert Fucik, Director of the Department for International Family Law of the Federal Ministry of Justice of Austria. The goal of this meeting was to raise awareness on the importance of private international law in the European Union. The discussion focused on the global perspective and the role of the Hague Conference on Private International Law, the achievements of European Private International Law and the dialogue between the Hague Conference and the EU.